Going on Holiday and worried about your fish? We are in the main lucky enough to be able to rely upon either a jolly nice and considerate neighbour or relative to leave in charge of checking your house and generally making sure everything runs smoothly while you are away. Anxieties can run a little higher when your neighbour or relative is asked to take responsibility... for the fish! Especially if they have no previous experience of keeping fish and they recognise just how much you like them!! You will be pleased to know that we run a "Lets make your neighbour/relation feel better about looking after your fish service". This involves you telling us where you live. 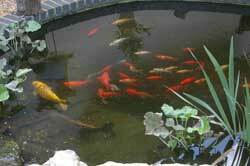 When we are in your area (see map), we will call in and acquaint ourselves with your pond. You then before you go away give said person our details and should they have any cause for concern they are very welcome to call us and we will be only too pleased to help. We will make no charge for the initial visit or any telephone calls or emails.